Amber, highly prized by humans for centuries and dreaded by insects for millions of years. Highly revered for centuries, amber is now serving valuable for another reason. It acts as a time capsule preserving life forms in incredible detail which existed hundreds of millions of years ago. Many of us were introduced to amber when Jurassic Park came out where the character John Hammond recreated a dinosaur world with the help of dinosaur DNA found within a mosquito that had been encased in amber. Although recreating prehistoric creatures from amber is fictitious, the fossilized tree sap does contain a wealth of insight into earth’s past. Basically amber is tree sap, the same which is found today oozing out of trees. The only difference is that amber is sap that was produced millions of years ago. It would fall of its tree host trapping matter and sometimes encasing life forms in the process. Found throughout the world, the main two areas that mine and distribute amber to the rest of the world are Dominican Republic and Europe’s Baltic Coast. Even in places like New Jersey you can find amber and in Denmark you can walk the beaches after storms in the hopes of finding nice size chunks of million year old orange tree sap. It is used for jewellery. medicinal healing purposes, and even in perfumes. Plants in the process of pollination: Looks like flora have been reproducing similarly since the dawn of time. And then there is the most famous amber discovery which has yet to be made. Some believe The Amber Room which was stolen by the Nazis in WWII still lies hidden in a bunker somewhere. With a value some say could be upwards of $500 million it would be by far the most valuable amber discovery to date. So what is or was The Amber Room? Considered by many to be the Eighth Wonder of the World, The Amber Room consisted of panels made of nearly 6,000kg of amber along with mirrors and gold leaf. Dateing back to the Kingdom of Prussia, the room intended to be placed in the Charlottenburg Palace but was instead placed within the Berlin City Palace which was the capital of Prussia. Over the years it would change its home several more times before ending up in the hands of Hitler’s army. Sadly it is believed that the panels were destroyed by bombing before Hitler’s request to have them moved to safety was carried out. Some say however that they were indeed moved to a secure location and await discovery to this day. Due to the fragile nature of the beautiful panels however, and future discovery would not see them in a state of their past glory. 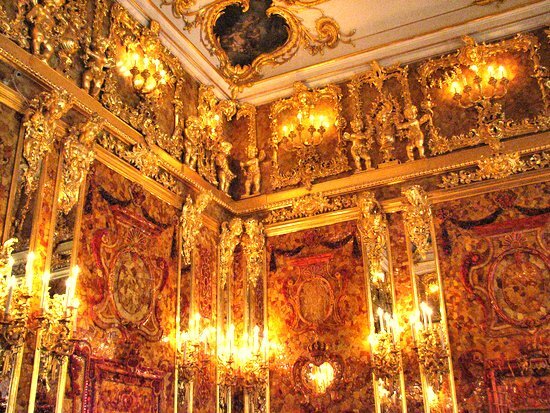 There is a replica of The Amber Room located in St. Petersburg, Russia. Inaugurated in 2003 by Vladimir Putin, the process to recreate the room using identical materials took nearly 25 years. Of course when anything becomes valuable it creates a market for fakes or replicas. Amber is no exception and one must be wary that the large spider or perfect butterfly they are eyeing in a block of amber. Finds like this are extremely rare if not impossible and therefore what you are most likely witnessing is a recreation in man made resin. There is also copal to look out for as well. It is basically what amber is before it fossilizes. The process to create amber takes millions of years whereas you can find copal which has trapped bugs and the such which may only be a few hundred years old. Some say however that copal can date back millions of years as well and only slightly differs from amber. Colombia, known for its trade in copal, regularly makes this argument. Whatever the truth may be, there is no denying that simple tree sap has proven to be a beautiful window to the past.